Urgent talks have been taking place to resolve how a 100m gap in a "flawed" flood barrier could be plugged in time for potential flooding in 2026. Planning permission has already been granted for the new £80m flood defences to be built along a 17km (10.5 miles) stretch of the Severn Estuary shore. But the Bristol Port Company identified "miscalculations" that left a hole in the plans around its lock gates. Now the race is on to find a workable solution to avoid widespread flooding. The Avonmouth and Severnside flood protection plan was submitted by the Environment Agency (EA) and local authorities for Bristol and South Gloucestershire. It proposed building a new 2.4m-high (8ft), 17km-long wall from Lamplighters Marsh at the mouth of the Severn Estuary, to the Severn Crossing in South Gloucestershire. But 7km (4.3 miles) in the middle of the barrier would be on Avonmouth Docks land, owned and run by the Bristol Port Company and, crucially, including the lock-gates entrance to the docks. Why is there a gap in the wall? "Ten years ago we were approached by the EA to look at flood defences," explained John Chaplin, director of external affairs at the port. "The proposals included walls along the side of the River Avon and across our lock entrance, including improved lock gates, to guard against potential flood events." But when the final proposal reached the area planning authority - in May 2018 - he said he was surprised to see "it appeared to omit, completely, a plan for the lock entrance". According to council documents, a reinforced dock entrance was removed from the plan, leaving the 100m (110yd) "breach" - including the 30m-wide (33ft) ageing lock gates and land either side of them - because EA analysis showed new lock gates were not really necessary for 60 years. They were deemed "not affordable" or "economically justifiable" for that reason. and extra finance was to be put into higher sea walls outside of the dock area instead. The port company believes the decision to omit a lock gate plan was based on incorrect data about the dates and effects of floods and that the correct data revealed plugging the gap sooner, rather than later, was essential. A gap in the defences would mean flood waters would be funnelled into the whole dock area, Avonmouth village and the Severnside business estate within seven years. The Bristol Port Company claims the EA made incorrect assumptions about how the lock gates might resist flood waters. Avonmouth Dock has a series of three sets of lock gates - the oldest dating from 1877 - that operate in the same way as canal locks. If the water level on the estuary side matches or rises above the dock water level - as it does now during high spring tides - it just pushes the gates open. Mr Chaplin explained: "The mistake the modellers made was to assume that, when there is a tidal flood, we can just close the lock gates and hold it back. "In order to have that level of control over the gates... we would need a completely differently engineered set of gates. When will flooding happen at Avonmouth? Of equal concern to the Bristol Port Company were the flood predictions submitted by consultants. They erroneously calculated - using government climate change data - that the next significant flood, affecting more than the port, should be expected in 2076. However, assumptions about land levels within the dock estate were "incorrect by as much as half a metre". "The consideration of the amount of flooding and flood damage that would occur... is wrong. The cost-benefit assessment is wrong. Subsequent decisions are unsound. "It would be unsafe... for the flawed scheme to proceed," the Bristol Port Company concluded. "We are not trying to get the EA to pay for new lock gates… it would be a joint cost. "But the money must be spent properly and fairly" so that the area and Avonmouth village "is adequately protected". The port company brought in independent experts, HR Wallingford, to undertake a flood risk modelling that indicated more extensive flooding - of the Avonmouth docks and up to 100 homes - would be likely to occur 50 years sooner than predicted by the EA, in 2026. The partnership now has seven years to find and engineer a solution. If it does not, flooding is expected to extend beyond Avonmouth, to the M49 boundary and right up the Severn Crossing. Mr Chaplin said: "There is a sense of urgency as 2026 is very close." Loss of the ASEA development sites "will be significant" by 2076. "The only way to prevent Avonmouth from flooding is to reinforce and raise the lock gates," their report said. Urgent talks between the Environment Agency, Bristol and South Gloucestershire councils and the Bristol Port Company are said to be "at a sensitive stage". "The EA has acknowledged that the gap needs to be filled," Mr Chaplin said. 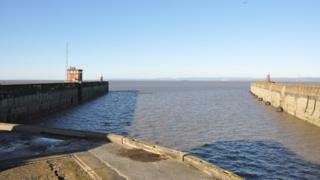 The port has provided costs for improved gates but said the flood barrier's £80m price tag would rise. It claimed money could be saved by lowering the walls along the rest of the barrier, by up to 2.7m (9ft). What do the councils and Environment Agency say? The EA and the partnership councils declined to be interviewed. A joint statement said: "Bristol City Council and South Gloucestershire Council have both passed resolutions to approve planning permission for 17km of improved sea defences and around 85 hectares of wetland areas for ecological mitigation. "This is a major step in the development of the ASEA which aims to bring 12,000 jobs to the area. "There is an opportunity to work with Bristol Port Company to improve defences further around the entrance to the port's Avonmouth Dock." They confirmed a proposal from the Bristol Port Company, including "integrating their planned upgrade of port dock gates with the new flood defences", was on the table and talks were continuing.